To print off your verse and have it handy throughout the week, visit the resource library. The resource library is free to everyone on my mailing list and you get access to all the printables. As you’ve surely seen by now, we all learn faster when the words are put into a tune. And scripture is no different! The letter Z was a challenge to even find a verse that began with that letter so finding a song for Psalm 97:8 was even more challenging! 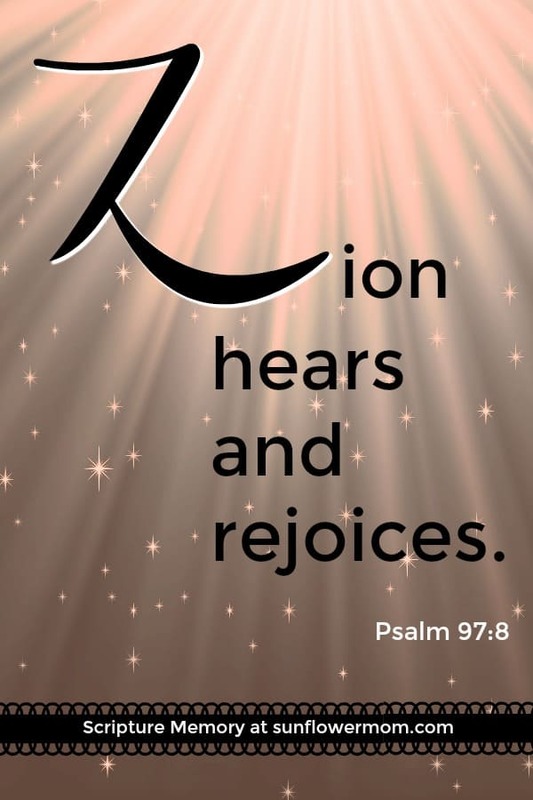 What follows is a song for all of Psalm 97. You can skip ahead to minute 1:30 in the song to hear our verse for the letter Z. It’s a short verse so hopefully, your child won’t need too much. Or as suggested previously, let your child make up their own tune. This may be the perfect way to end the activity for them. Either let them put Psalm 97:8 to the tune of their favorite current song or help them along. The key is to not stop reviewing the verses. Although it no longer needs to become a deep study, it now needs to become more of a habit to keep all the verses fresh. You can probably recall right now which verses were more difficult to memorize than others. Those will be the first to leave the memory bank. Sing a different verse before bedtime each night. Print the ABC Memory Verse cards from the resource library and play trivia once per week. This works especially well if you have more than one child. At the end of each month have a “contest” and see who can still recite the most verses from the ABC Bible memory verses. For each one they get right, they get a quarter or a piece of candy. 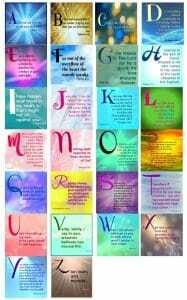 Print the ABC Memory Verse cards from the resource library and hang up a different card each week where everyone can see it. Or work through all the verses again, using the ABC Ultimate Memory Verse Guide!